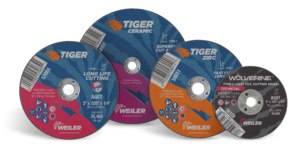 Weiler Abrasives has expanded its offering of small-diameter cutting and snagging wheels for high-speed die grinders to include Tiger AO, Tiger Zirc and Tiger Ceramic. These 2- to 4-inch diameter wheels are designed for long life and fast cutting and join the Wolverine value wheels already offered in this category. The 38-item expansion provides end users in the metal fabrication and ship building industry with increasing levels of cutting performance to meet their needs. Weiler Abrasives will offer the Tiger wheels with 1/4- and 3/8-inch arbor hole sizes. Weiler’s Tiger AO cutting wheels feature an aluminum oxide grain and provide even, sharp, clean cuts along with a hard bond to extend wheel life when cutting steel. Like the Wolverine wheels, Tiger AO wheels are available in thicknesses of .035, 1/16, 1/8 and 1/4 inch. The Tiger Zirc cutting wheels are available in .035-inch thickness. 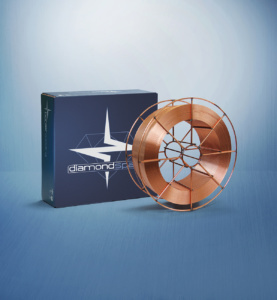 These wheels feature sharp, aggressive zirconia alumina grains that retain a high cut rate throughout the life of the wheel, making them an ideal choice for cutting steels, including structural and cast iron. For maximum cutting performance, even on stainless steel and hard-to-grind metals, the Tiger Ceramic cutting wheels provide superior life. The self-sharpening grains reduce discoloration by cutting at lower temperatures with less friction and require less effort to use, minimizing operator fatigue. The wheels are available in 1/16-inch thickness. Weiler Abrasives’ small diameter wheel offering also includes Type 1 Tiger AO and Wolverine AO snagging wheels for die grinders, as well as Type 27 Tiger AO wheels. voestalpine Böhler Welding is now offering weather-resistant seamless cored wires, including three FCAW wires and one SAW-FCW wire, in combination with two different fluxes designed for use with weather-resistant steel. Weather-resistant steel includes alloys that form a protective oxide layer on the base metal. Applications of weather-resistant steel include bridges, containers, tanks, chimneys, industrial filters and architectural elements.